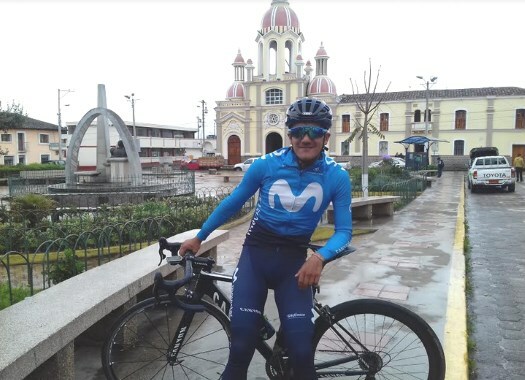 Not many cyclists can call themselves a pioneer for their country, but Movistar's Richard Carapaz certainly can as he has put Ecuador on the map at the highest level of the sport. Carapaz joined Movistar as a stagiaire in 2016 and was unexpectedly selected for his first grand tour, the Vuelta a España, a year later. The South American is now getting ready for his second three-week challenge. CyclingPub's Marcelo Hernández met with Carapaz in his hometown at Julio Andrade, a nice little town in the Ecuadorian Andes. There, Carapaz is finishing his preparation for the Giro d’Italia. The Giro starts in only two weeks from now. What do you think about this year’s route? Do you see some stage or week that is especially challenging? I think that the whole Giro is a very hard race, for which you must be well prepared. Not only physically but also mentally prepared. It’s a race where I think there is going to be a lot of selection in the mountain stages; even though this year there are not as many mountains as in previous editions I think it will have enough of them to be a hard race. This year’s edition has some sterrato sections and there is a climb that ends with dirt roads, so I think that is going to be an additional point of difficulty for the peloton. Have you been working on your performance on sterrato? Yes. Our country (Ecuador) is privileged in that way and I could train very well here. I have a near climb here called Alto de Chiles that has more or less nine kilometers of dirt road, so I think I’m going to Italy very well prepared. I am also very excited because this race is a great test for me. It is a new and great challenge both for me and my team. I feel privileged to participate in such a great race. Besides supporting Carlos Betancur, what will be your personal objective in the Giro: are you looking for a good place in the GC, or maybe a stage victory? There are several stages in which we can be protagonists, so there is that chance. Chances are open since a lot of young riders are going to this race and each one of them will be looking for a place in the race and the GC. What I would really like is to wear the best young rider jersey, that is my dream and I will try to go for it. During the spring you delivered outstanding performances like in Paris–Nice and in the Settimana Coppi Bartali, where you finished third overall. What are your thoughts about your first three months of competition? I have very good sensations about it, because in this time I could adapt to a good race rhythm. I know that what’s coming is very challenging, and the step by step progression I’ve been making since Argentina, where my season started, has been very good. Later, in Colombia, and at the two races in Europe I was in a good shape, I think, so they left me with a good taste. I could even be on a podium and that is a big accomplishment that can’t be taken away from me. It was a privilege to be there, showing my team’s jersey and particularly showing the good condition I currently have. Speaking about the Settimana Coppi – Bartali, you did a great ITT in the last stage. Is the time trial a subject you have been specifically working on? I think that the time trials are very hard tests because they’re different, the bike is also different, and you have to adapt to it. I have been working on my time trial because it is a terrain where there are a lot of time differences and where the fight for the GC happens, so it can’t be neglected. I have been training on that a lot, also during these days in Ecuador, so I think I’m well prepared and confident in that this challenge will come out the best as possible. You are the first Ecuadorian rider to make the jump and join a WorldTour team in history. What are your thoughts about being a pioneer in Ecuadorian cycling? It is a pride for me, to race with a WorldTour team and go to Grand Tours, being the first Ecuadorian to do so. For me it was like to conquer a new climb, because to become a WorldTour rider is very difficult and I was able to do so. It was very exciting for me to sing with Movistar, and the feeling I got is that I’ve proven to all the young guys that will come after me, that where there is a will there is a way, and if you have a dream, and work day after day for it with consistency, you can do a lot of things. Not only to race in a WorldTour team but also aim for the win of a race, and I think that is something I could demonstrate. In that sense I think I am a pioneer, in showing the potential of Ecuador and Latin America. In your opinion which is the main difference between the competition in Europe and Latin America in general, since you also raced in Colombia? Racing in Europe is very different because the races are much more tactical, while in Latin America the racing is more reckless, a little bit crazier. It is very different in Europe because cycling relies on the team, which is the basis for winning a race. That change has been a big step in my career and I’ve been able to adapt very well. What was the most difficult thing to adapt to when you became a WorldTour rider? I think it was the way of racing, which was very different to what I was used to. Suddenly, things like the location in the peloton, avoiding the over-efforts were very important and to me getting that was though. I was a stagiare first and those three months were such a great school and I could learn a lot. I was like a sponge during that time, absorbing all of that so when I could finally make my debut it was a little bit easier. So, for me the rhythm and way of racing was the most challenging. As I said before, here (in Latin America) the racing style is kind of careless while in Europe the work is based on the team and one specific rider which is the leader and will fight for each race. Speaking about team leaders, how has been your experience sharing a team with some of the current greatest names in cycling such as Alejandro Valverde or Nairo Quintana? Since most of the time we have very different racing calendars I’ve been with Nairo or Valverde very few times, so I couldn’t say a lot about that experience. With Nairo I could share more time, such as the week we spent together in Colombia and that has been highly motivational since he has accomplished a lot at a very young age, being a champion of Giro and Vuelta; and that example motivates me to keep working. These are great experiences and I can learn a lot from these people now that we share a team. Last year you also became the first Ecuadorian ever to ride the Vuelta a España, where you delivered such a good performance. How did you feel when you were selected for the Vuelta in your first year as a pro rider? The Vuelta wasn’t in my plans initially, but during the spring I had a good performance making a podium (GP Industrias e Artigianato) and then in the summer, in France, I could be on the podium again (Route du Sud) so all of that was meritorious for going to the Vuelta. I wanted to experience a three-week race because I never did such thing before. I had ridden two-week races at best, so the third week at the Vuelta was very decisive and really hard for me. Besides the physical exhaustion there was the mental one of being on the bike day after day. It was a good experience and I think it gave me the maturity to face this new challenge. One of your best moments in the Vuelta was the Angliru stage, where you finished 11th. During the previous days did you mark that stage or did you ride each day according to your daily sensations? The team and I had an eye on each mountain stage. I wanted to know how far I could stay with the main riders so most of the summit finishes were in our plans, thinking always about getting a podium but it was really hard because my training wasn’t according to such a long race. But the sensations I got from it were good and it was very positive because we realized that there is talent and we have to keep polishing it. From your whole experience at the Vuelta, what do you think are the most valuable lessons you can now apply to the Giro? First, the training has to be different for a three weeks race. As I said, when I went to the Vuelta I wasn’t physically well prepared and to face three weeks of racing was very hard. But that’s how you get experience and going through the three weeks on the bike was good and important. The training I’ve been doing now is very different from last year’s and that motivates me to do a great Giro. Also, there is the experience on the mountain and in the heat, because we went through a lot of heat during the Vuelta and to know how to stay hydrated and eat properly is fundamental when you face the hardest stages, such as in the Vuelta on the Angliru. What do you think is the main thing that Latin America, specifically Ecuador, could do to become more relevant in international cycling? There are a lot of things that we lack of, in Latin America. Right now, in Ecuador there are no high-profile formation schools and those are the basis for amateur teams. There are some smaller schools but they work by themselves, so it’s very difficult to get some young riders to foreign nations because the costs of doing so are high, a lot of money is needed and here the sponsors are very limited or there are none. Finally, what other objectives do you have in mind this season after the Giro? Well for now my focus is on the Giro. With the team we want to do a very good race and are 100 percent focused on doing so, so we hope we will have the best results. For now we don’t have a calendar defined for the second half of the year, it will come according to the condition in which we finish the Giro, but I think that an option could be to go to the World Championship.